Mohave Desert near Twentynine Palms, California. Same location in March 1977. 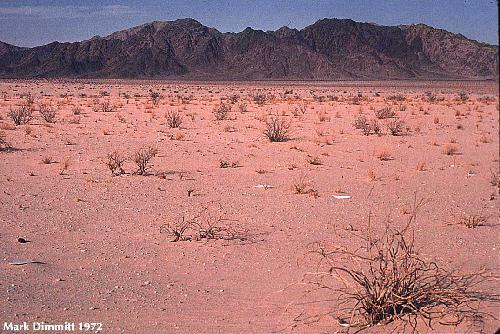 One distinguishing characteristic of deserts is extreme contrasts. For example, the stark contrast between sun and shadow is dramatically different from the softer light of humid lands, and has inspired many artists in various media, including some exultant prose. Weather swings between extremes too, and the great variation in rainfall from year to year has a dramatic effect on the flora and fauna. It seems contradictory that a landscape that is most famous for its parched and barren character could also be famous for spectacular displays of wildflowers. Yet it's true. 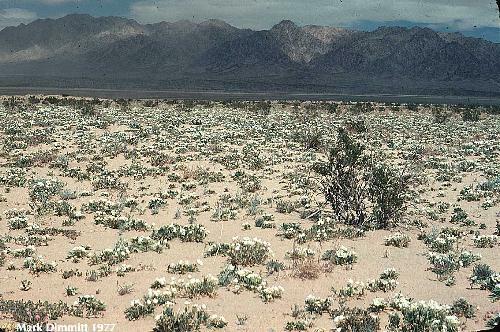 In fact the most extensive carpets of wildflowers in the North American deserts occur in their most arid parts - such places as Death Valley, Anza-Borrego, the Gulf coast of northern Baja California, and the Gran Desierto-Pinacate region. Don't misinterpret the annual photo essays in travel magazines. Beautiful scenes of desert wildflowers are featured in their pages nearly every year but they are as rare as they are beautiful, and ephemeral too. Professional photographers know that they must rush out to catch a bloom whenever it occurs, because they may not get another opportunity for ten or 20 years. Furthermore, what triggers these floral fireworks extravaganzas is still very much a mystery and predicting a good bloom is nearly impossible until it's about to begin -- see Predicting Wildflower Blooms for more details. Some definitions: In this website, the term wildflower (one word) denotes the annuals and herbaceous perennials that appear above ground only in wetter than average years. Examples of these are desert lupines, Mexican gold poppies, and desert lilies. The term wild flower (two words) encompasses all of the flowering plants that occur in the region, including perennials such as palo verde trees, brittlebushes, cacti, and ocotillos. When wildflower information lines say that it will be a poor year for wildflowers, it DOES NOT mean that there will be no flowers. Some desert flowers bloom nearly every year -- see Desert Flowering Seasons and What's in Bloom for information on flowering times of other desert plants. How pale-blue the Lost Mountains look under the growing light. I am watching their edges develop into broken barriers of rock, and even as I watch the tallest tower of all is struck with a bright fawn color. It is the high point to catch the first shaft of the sun. Quickly the light spreads downward until the whole ridge is tinged by it, and the abrupt sides of porphyry begin to glow under it. It is not long before great shafts of light alternating with shadow stretch down the plain ahead of me. The sun is streaming through the tops of the eastern mountains and the sharp pointed pinnacles are cutting shadows in the broad beam of light. That beam of light! Was there ever anything so beautiful! How it flashes its color through shadow, how it gilds the tops of the mountains and gleams white on the dunes of the desert! In any land what is there more glorious than sunlight! Even here in the desert, where it falls fierce and hot as a rain of meteors, it is the one supreme beauty to which all things pay allegiance. ...the chief glory of the desert is its broad blaze of omnipresent light.